Here I sit again, talking about my needlepoint projects as usual. 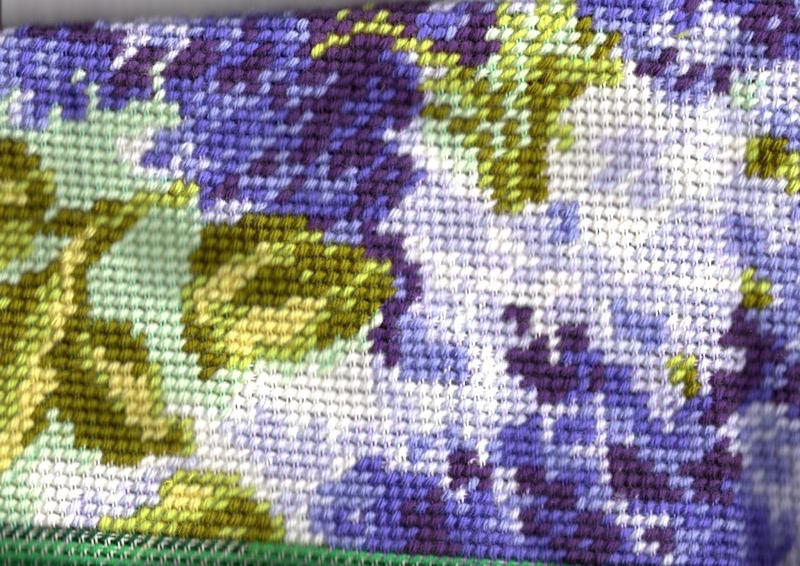 Now "The Lilacs" is a FO (Finished Object). I packed it away, so that as soon as the frosty weather calms down, I can take it and the Lion King to the local post office and send them to the local Framing Man. He knows what to do with them. Now that one more canvas has been stitched to the last stitch, I knit another arm of the bear I call Ascanius. Lavinia has already traveled to the next destination from here, but that place isn't her final home. I hope my friend will stitch Lavinia together and embroiders her name on her body. The friend also has to add Lavinia a face. And she must do the same for Ascanius. But Ascanius will join Lavinia a bit later. Ascanius is Lavinia's mate. Ascanius & Lavinia are my surprise to the little princess far in the south. Once Ascanius' arm nr. 2 is done, I can grab another canvas and stitch it. That way I don't need to feel bad conscience about neglecting either projects.